A natural resource is what people can use which comes from the natural environment. Examples of natural resources are air, water, wood, oil, wind energy, natural gas, iron, and coal. The dividing line between natural resources and man-made resources is not clear-cut. Hydro-electric energy is not a natural resource because people use turbines to convert the energy from moving water. Petroleum and iron ores are natural, but need work to make them into usable refined oil and steel. Atomic energy comes from metallic nuclear fuels, like fissionable uranium and plutonium, but natural rocks need technical work to make them into these nuclear fuels. We often say there are two sorts of natural resources: renewable resources and non-renewable resources. A renewable resource is one which can be used again and again. For example, soil, sunlight and water are renewable resources. However, in some circumstances, even water is not renewable easily. Wood is a renewable resource, but it takes time to renew and in some places people use the land for something else. Soil, if it blows away, is not easy to renew. A non-renewable resource is a resource that does not grow and come back, or a resource that would take a very long time to come back. For example, coal is a non-renewable resource. When we use coal, there is less coal afterward. The non-renewable resource can be used directly (for example, burning oil to cook), or we can find a renewable resource to use (for example, using wind energy to make electricity to cook). Most natural resources are limited. This means they will eventually run out. A perpetual resource has a never-ending supply. 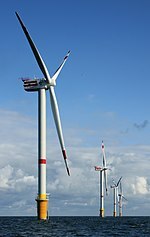 Some examples of perpetual resources include solar energy, tidal energy, and wind energy. There may be a limit to how much can be taken in a given day or year, but that amount can be taken again next day or next year. Some of the things influencing supply of resources include whether it is able to be recycled, and the availability of suitable substitutes for the material. Non-renewable resources cannot be recycled. For example, fossil fuels cannot be recycled. The demand for resources can change with new technology, new needs, and new economics (e.g. changes in cost of the resources). Some material can go completely out of use, if people do not want it any more. Demand of many natural resources is very high, but availability of some, such as precious metals, is very low. Different places have different natural resources. When people do not have a certain resource they need, they can either replace it with another resource, or trade with another country to get the resource. People have sometimes fought to have them (for example, spices, water, arable farmland, gold, or petroleum). When people do not have some resources, their quality of life can get lower. So, people protect resources. When they can not get clean water, people may become ill; if there is not enough wood, trees will be cut and the forest will disappear over time (deforestation); if there are not enough fish in a sea, people can die of starvation. Renewable resources include crops, wind, hydroelectric power, fish, and sunlight. Many people carefully save their natural resources so that others can use them in future. This page was last changed on 22 April 2019, at 13:46.